Want to book a 2 Day Rwanda Gorilla Tour or a 2 days Uganda gorillas from Rwanda package? A two day intriguing Rwanda excursion involving a well guided Kigali city tour where you get to visit the prominent sites within the city, the genocide memorial sites and interact with the local people before proceeding to Volcanoes National Park for a Rwanda gorilla trekking experience. The 2 days budget gorilla trekking tour is suitable for travelers who want to get the best of the gorillas and the capital in just two days. The gorilla tour fits all budgets and also suitable for all ages. 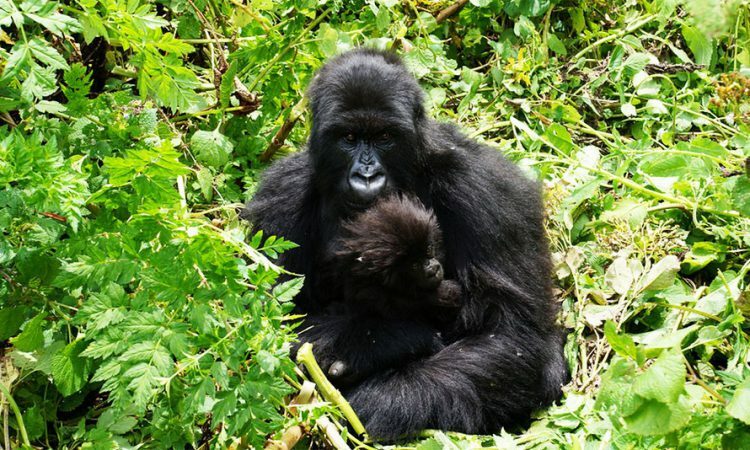 This 2 days Rwanda gorilla tour has two options. The first is tracking gorillas in Volcanoes National Park in Musanze and second is arriving through Rwanda, transferring to Bwindi Impenetrable National Park for gorilla trekking and returning to Rwanda for departure. We also have a three and 2 days bwindi from Kigali safari package in case you are interested in this kind of arrangement. Upon arrival in Rwanda for your gorilla tour, a guide from our Rwanda travel company will pick up at the Kigali International Airport and brief you on your two day Gorilla Trek. Our guide will give you a tour of Kigali city; this will include the Genocide Memorial Center, the most famous attraction in the Capital City after which you will proceed to Volcanoes National Park and check in at your accommodation. Dinner will be served at your lodge. In the morning by 8:30 am, you will gather at the park headquarters together with tracking gear and parked lunch for briefing before heading in the forest to track the gorillas. This may take 2 – 8 hours depending on the movements of the animals. On return, your driver will drive you back to Kigali and then to the airport for your departure flight. Note: When inquiring for this tour, please indicate whether you prefer to track Rwanda gorillas or rather transfer to Bwindi for your Uganda gorilla trekking experience.